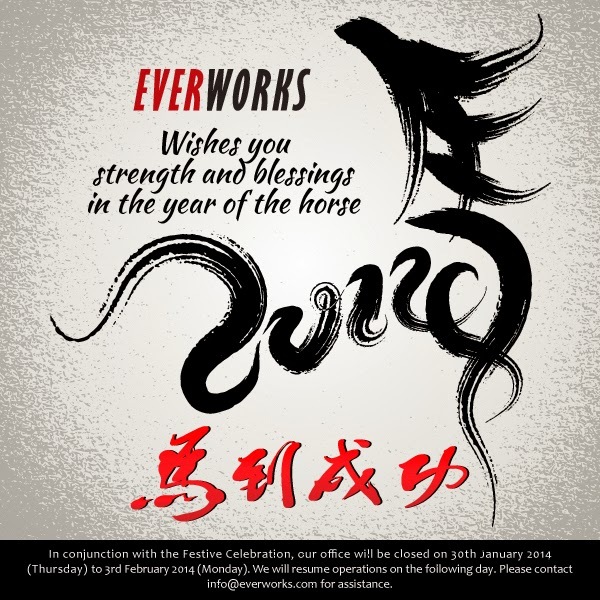 May all our dearest customers and readers have a blessed Chinese New Year! This year is the year of the Horse! The spirit of the horse makes unremitting efforts to improve themselves; it is energetic, bright, warm-hearted, intelligent and able. People born in the year of the horse have great communicating techniques. They are cheerful, perceptive, talented, earthy but stubborn! They cannot bear too much constraint. They are overly independent and rarely seek advice. Those born in 2002, 1990, 1978, 1954, 1942, 1930, 1918 this year is your year! The year of the horse means there is a greater leadership associated with it this year, but the impulsive behavior of the horse can lead to recklessness! WORK : People in position of authority at work will do well, but don't expect to make a lot of money and value the income you have! LOVE : There won't be a lot of excitement in your love life! HEALTH : Watch your health this year - Make exercise and rest a priority! What are your new aspirations this Chinese New Year?